For the next few months I'll be focusing on soups. 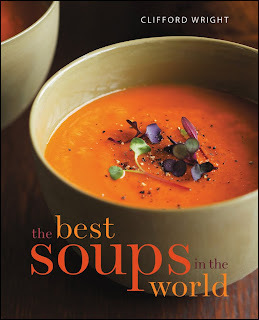 My newest book to be published by John Wiley & Sons, THE BEST SOUPS IN THE WORLD, will be coming out in December. I had enormous fun writing that book and my appreciation for soups grew. There are so many, just from the Mediterranean alone, that people don't know. Take for instance the soups from the island of Corsica. Although a department of France, Corsica has its own culture and language, related more to Italian than French. The food of Corsica is rustic. For instance, many cheeses on the island don't have names, they're simply called "cheese." This goes for soups too, many simply called "soup" (minestra). A good example of a rustic Corsican minestra is also known as soupe paysanne (country soup). There's a recipe here.